Sandy Straits and Beyond: Few Birds! I was going to put - No Birds! - because I didn't find the large flocks of migrating shorebirds I expected! Migratory shorebirds have been arriving around the bay for the last week or so. There have been 400+ Godwits reported at one site and 70 Eastern Curlews at another so I expected to see similar flocks at Inskip Point which seems to be used as a staging roost for most of the migratory shorebirds. So where were they? I hope I can time it right to see the expected big flocks next time I go out there! With the changes that have happened to the Point over the last few weeks (see post for August 20) I knew I had to be out there at high tide and before anyone else was there to disturb the birds. 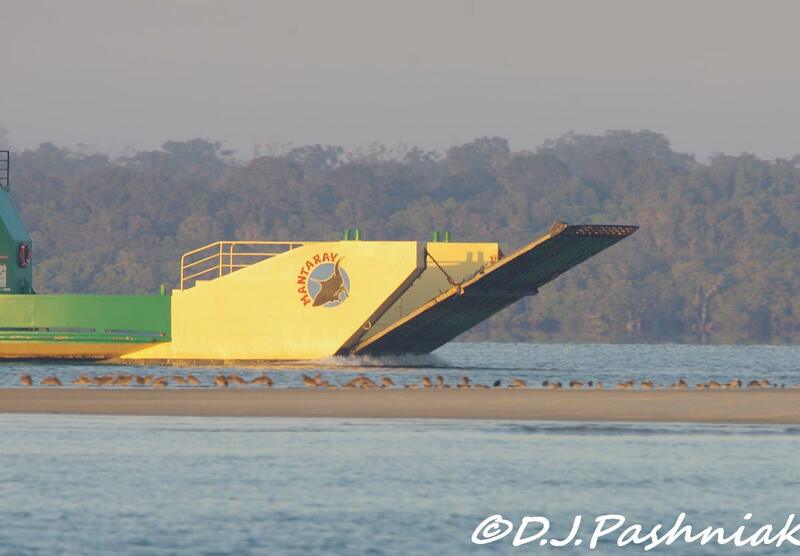 That meant sun-up before there were any vehicles driving around and before the barge to Fraser Island started operating. There has been a lot of burning off over the last few weeks and the haze over the sea made spectacular colors as the sun first appeared. These colors disappeared as the sun rose higher. I walked along the point to where I could see a few terns and gulls roosting. The barge was just leaving Bullock Point where it ties up for the night. I watched it come down the bay and passed a yacht anchored for the night on the far side of the sand island and closer in a few pelicans roosting on the sand spit. As it moved passed the island I could see a line of Eastern Curlews and Bar-tailed Godwits roosting out there - but no large numbers! 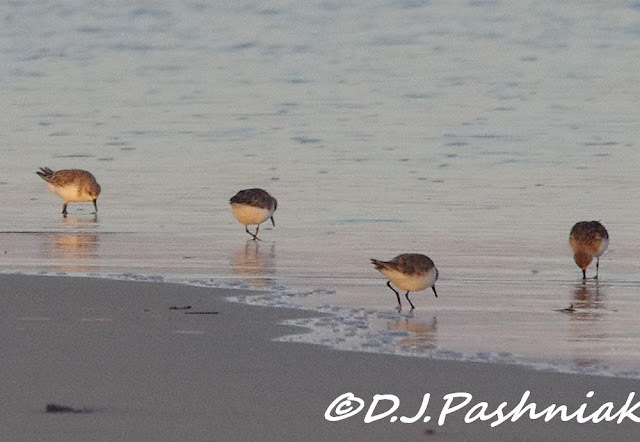 There were also some smaller shorebirds with them but I could not make out details without a spotting scope - and I can't carry camera gear and the spotting scope! There were a few small shorebirds roosting at the end of the point with the terns and gulls. There were still a few Double-banded Plovers in breeding plumage. There were also a few Red-necked Stints. Some of these birds still had faint washes of breeding colors and all of them were busily feeding on the wet sand as the little waves came in and then retreated. It was good to see them but half a dozen birds are not the flocks of 100s which will soon be here. All the time I was out there I could hear a juvenile tern "whinging" for a parent to feed it. There are always a few juveniles that refuse to take responsibility for their own food and follow a parent bird with these constant cries to be fed. At this age and size these juveniles are quite capable of looking after themselves! 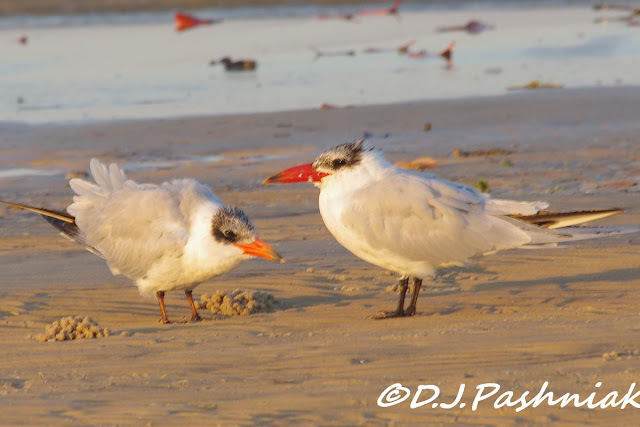 I eventually saw this Caspian Tern with the juvenile begging. 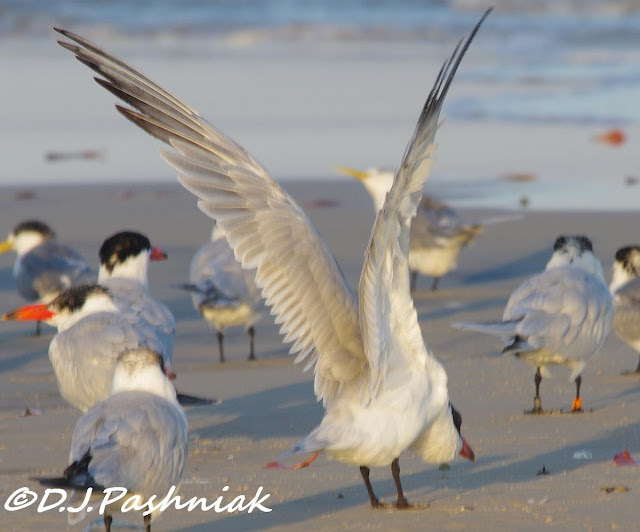 Caspian Terns are the largest terns we see here and the wings are really massive. This one was just stretching. There were also numbers of Crested Terns - most of them still looked "scruffy" with plumage half way between breeding and non-breeding. 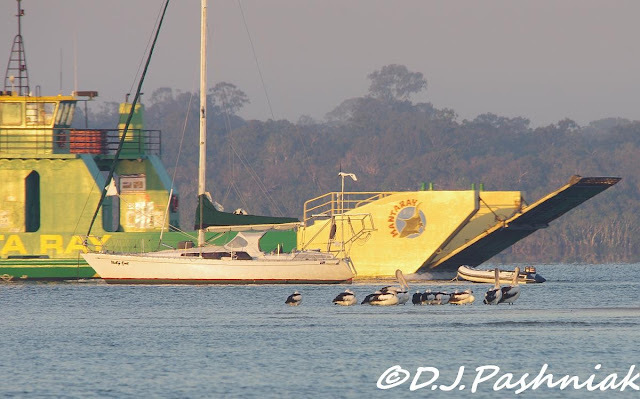 There were one or two looking very sleek with almost full breeding plumage. 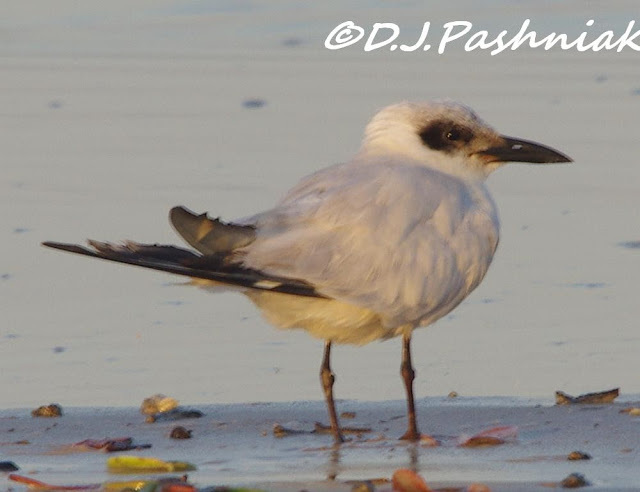 This is a Gull-billed Tern in non-breeding plumage and the only one out there that morning. That's sort of funny/sad that some birds refuse to grow up... apparently humans aren't the only species where that happens! Whatever else it does, smoke in the air definitely provides some beautiful skies. I hope the changes in your area don't permanently affect the bird population...the ones you found today, even if fewer i than what you hoped, are wonderful. You've got some fabulous shots of both the birds and the sunsets! Beautiful. Beautiful captures for the day, Mick! I do love the birds and such lovely skies! A wonderful world you have indeed! Thanks for sharing! Have a great week!! Thanks as always for you comment on my blog!! The colour of that sky is gorgeous! Nice work, Mick! Particularly love the shots with the barge in the midground and birds to the fore --- humans and animals busy with their own activities. Wow, the sky is gorgeous, love the color. 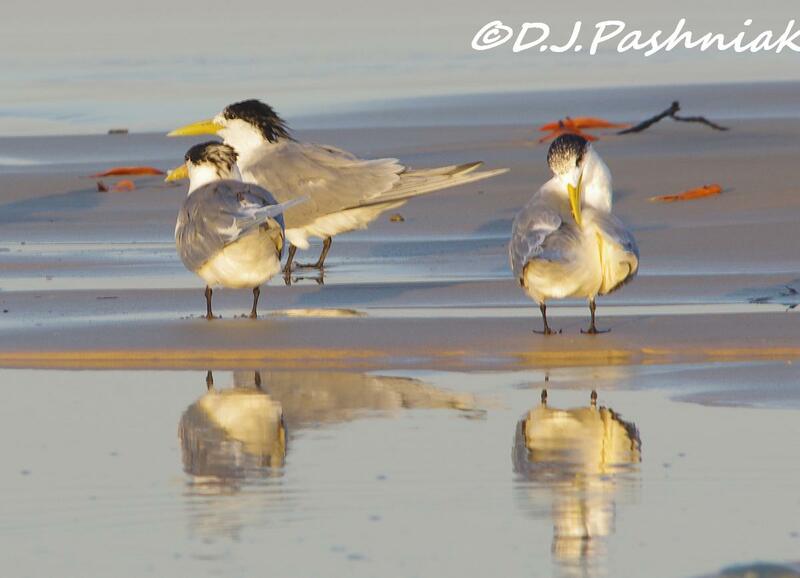 And I love the Terns, awesome closeups of the Caspian Terns and the cute gull-billed Tern. Great post, have a happy day! 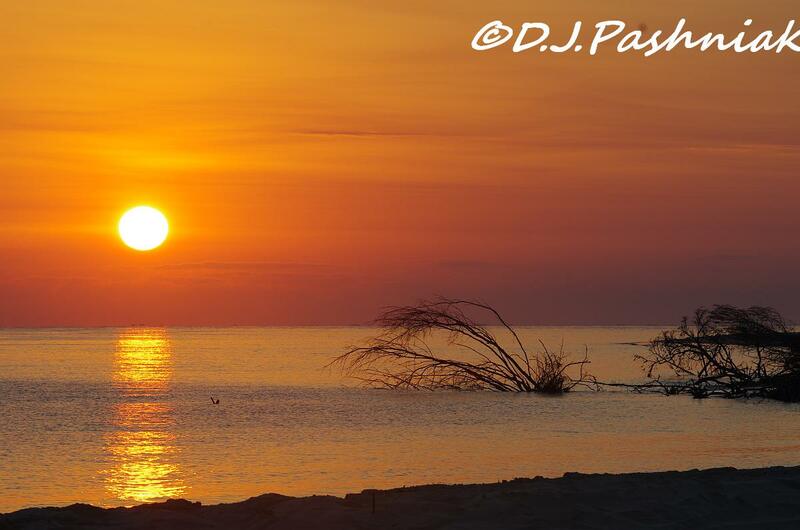 Stunning sun photos!! Boom & Gary of the Vermilon River, Canada. I agree when you say Caspian Terns are hugs - I could not believe how big there were the first time I saw one! Wonderful sunrise and nice sighting of the birds. Veľmi pekné fotografie so slnkom a pre mňa noví a zaujímaví vtáci, takí u nás nežijú. Very nice photos with the sun and for me new and interesting birds, so do not live with us. Even though you didn't find large numbers, you saw SOME birds! And a super sunrise! And you smelled salty air! And you got out of the house! All in all - I'd call that a good day, Mick! 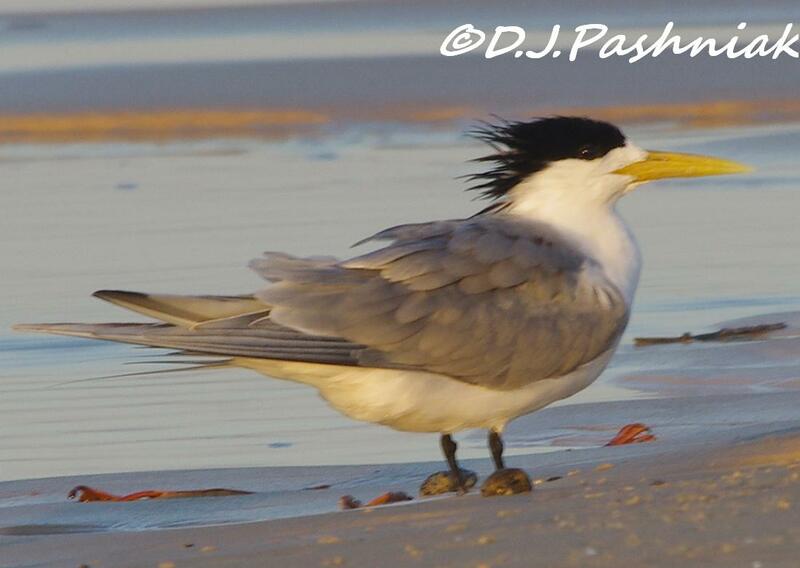 Awesome sunrise photos and great birds, especially the crested terns. I'm glad you found some birds, they are just awesome to see! 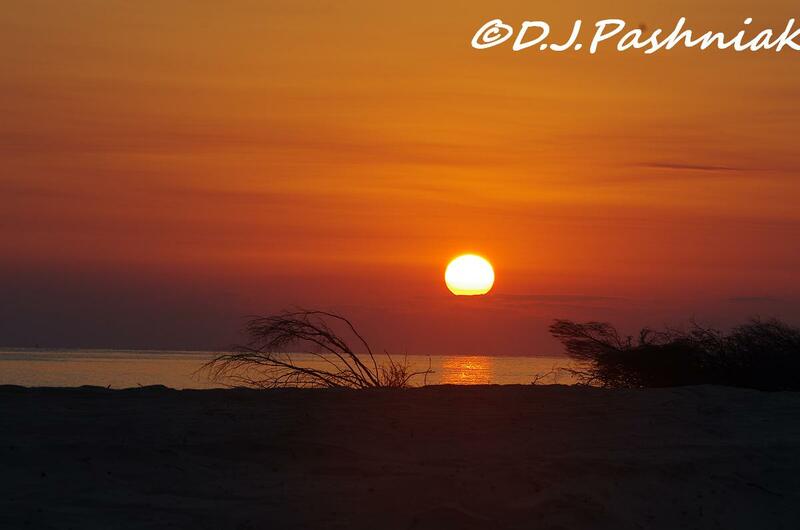 And the sunrise shots would be worth getting up for! I love the sunset shots! The colours are so beautiful. Enjoyed this! I would have been happy with the numbers, Ha ha! Wonderful shots! I love watching the water birds and a great reason to go to the beach! Beautiful images! And I love the Gull-billed Tern. Never seen one before. Sounds like some juvenile birds behave a lot like some juvenile humans. We have a lot in common, eh? Hi Mick... Well there may not be many , but what you saw made for some great photo's !! Love the closeups, and the stretched wings one is cool! !